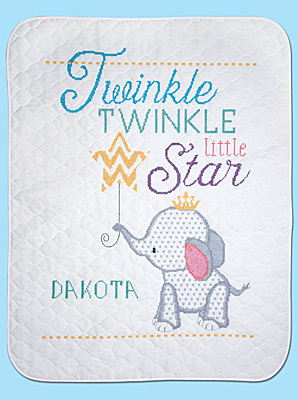 Our beautiful yet simple design by Jennifer Pugh that can be personalized will brighten any nursery whether used as a wall hanging or quilt. Each kit includes one prefinished 50% Polyester/50% cotton screen printed quilt, 6-strand cotton floss, needle, instructions for personalizing, chart and instructions. Finished size is 34" x 43".